Make your PC faster than ever. Boost your memory in critical situations and prevent crashes. While using your PC, the executed programs and the used files are taking part of your RAM memory, progressively slowing down your equipment. RamCleaner can recover the leaked memory to make your system work as fast as it was at the beginning. 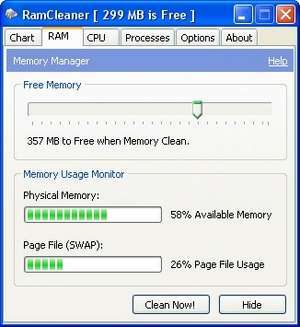 RamCleaner 7.2 is a shareware program and can be used as a demo to try the software until the free trial period has ended. A full version of the program is available after the trial period ends. For security reasons, you should also check out the RamCleaner download at LO4D.com which includes virus and malware tests. Additional screenshots of this application download may be available, too. RamCleaner has a presence on social networks.